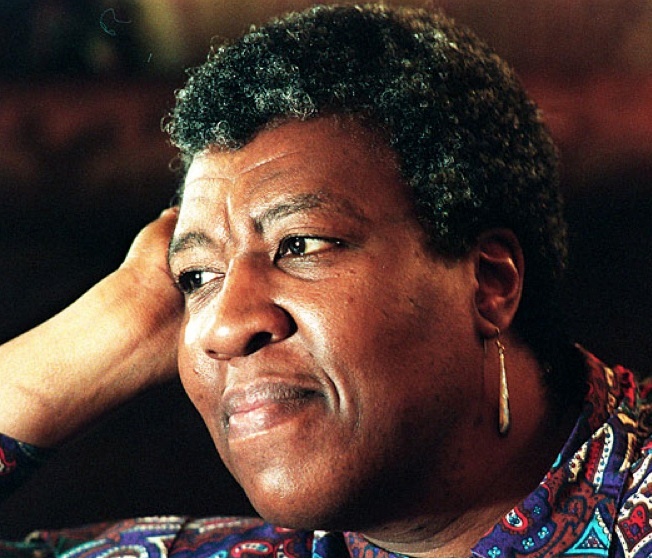 The science-fiction writer Octavia Butler was a pioneer who believed utopias are not possible because people will never be perfect. She was concerned with human connection and alchemical transformation, born of dystopias that do not feel far-flung from where we are now. On November 2nd 2005, I attended a talk with her at the Los Angeles Central Library. The occasion was the release of her novel Fledgling, a vampire story that changes the usual rules with an unusual protagonist. I’d been a fan for years. Octavia’s stories play with gender, race and class, using science fiction to explore the human condition through themes of social justice, community, time travel, and telepathic communication. God and its absence. Cautionary tales regarding ways of being on this earth. Her Parable books are still prescient today, even more so than when they were released in the early 1990’s. She had taken a long break of seven years between publications due to reasons of health and the kind of writer’s block where you produce but have no faith in the value of what you’re creating. She was the type of woman who wasn’t shy of telling you truths about herself, especially if it could help new writers face their insecurities. During the talk, she spoke of being excited about the prospect of new projects. She exuded confidence and enthusiasm about the future. Less than four months later in February of 2006, she died suddenly after a fall at her Seattle home. Her untimely passing knocked the wind out of a dedicated following who were ecstatic to have her back. She was 58 years old. When she was little, Octavia always dreamed of being a writer. She was an only child raised by women; her mother, a maid, and her grandmother. Her father, a shoe shiner died when she was a baby. Science fiction provided the perfect escape route from the loneliness and isolation she felt while growing up in a struggling, racially mixed neighborhood in Pasadena. Her fictive journeys began while watching a film called Devil Girl from Mars, when she was twelve. "Gee, I can write stories better than that. ", she mused. And boy did she ever. Aside from an associate’s degree, she never finished college but did take several writing workshops, one in particular with Harlan Ellison who she’d always claim as an important mentor. She read, and she wrote. Consistently. Her skills grew, as did her reach. Intelligence and curiosity radiated from her. Each genre of art has its world and insiders, and Octavia was an anomaly in her field. When she appeared on Charlie Rose, he fumbled all over himself, clearly unprepared about her work and clueless as to how to approach an insightful dialogue with her. I don’t think I’ve ever seen him quite so flummoxed. It was hard to watch him squirm. And she, the epitome of grace through it all. What touched me most about Octavia was her physical form and its relation to her protagonists. She was a tall, big-boned woman with masculine features, angles and planes softened by a gentle demeanor. In the West Indies they’d call her looks 'obzoky'. I call her beautiful. A tree-trunk of a woman, roots reaching up not down, with a very different creature peeking out from the frame. When I look at photographs of Octavia I can’t help but see her characters, the girls living inside her, especially two; Lauren Oya Olamina the prophet and Shori of Fledgling, a wisp of a girl, immortal at 53 in an 11-year-old body. I wish Octavia had lived to see and hear the work of her spiritual progeny, Janelle Monáe. She would have loved Janelle, would have been proud. But then again, maybe she IS Janelle. Although it broke many a heart to lose Octavia, I felt her at peace --the lonely girl-creature who dreamed of a life beyond the world she longed to better, set free. Looking up on certain nights, I imagine her there planting seeds among the stars.